The granite ridge gradually subsides. 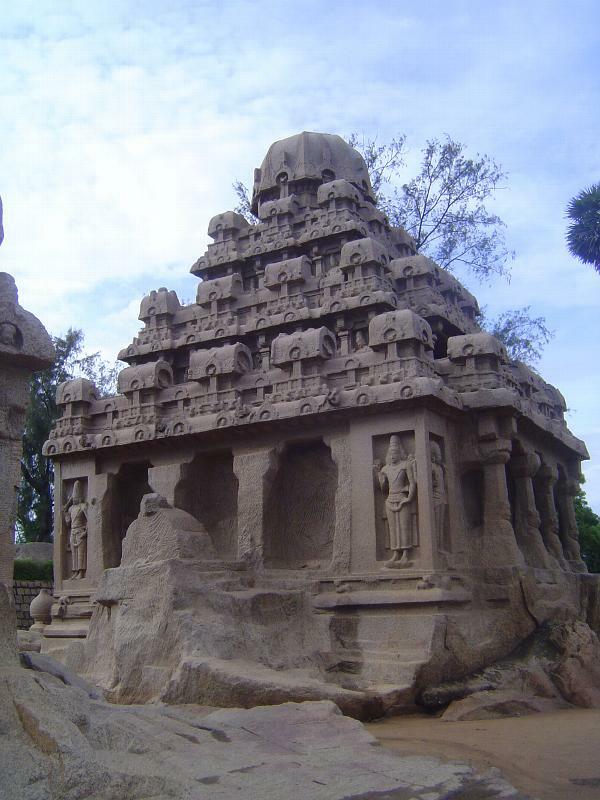 At the point on the south where it barely rises above the general ground surface, the rock has been scooped away so that a set of five temples remain as the residual outcrops. The site looks a little sterile, but in the 19th century it was messier, with enough accreted soil that the surface was level with the temple platforms. It was also overgrown with scrubby vegetation. What it was like in the 8th century is anybody's guess. Presumably the temples were painted. But what were they for? 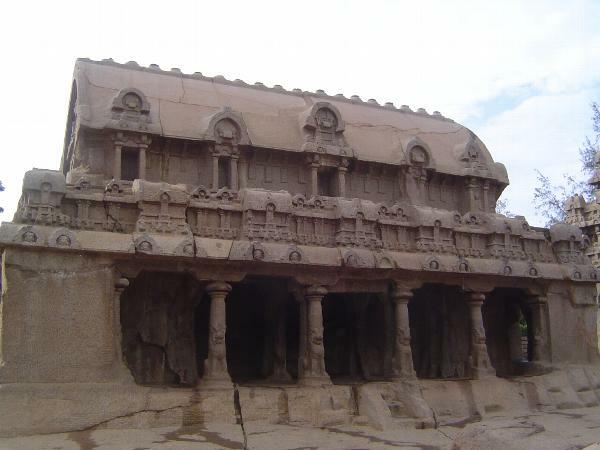 Some have suggested they were an architectural museum, representing in stone several kinds of wooden buildings. 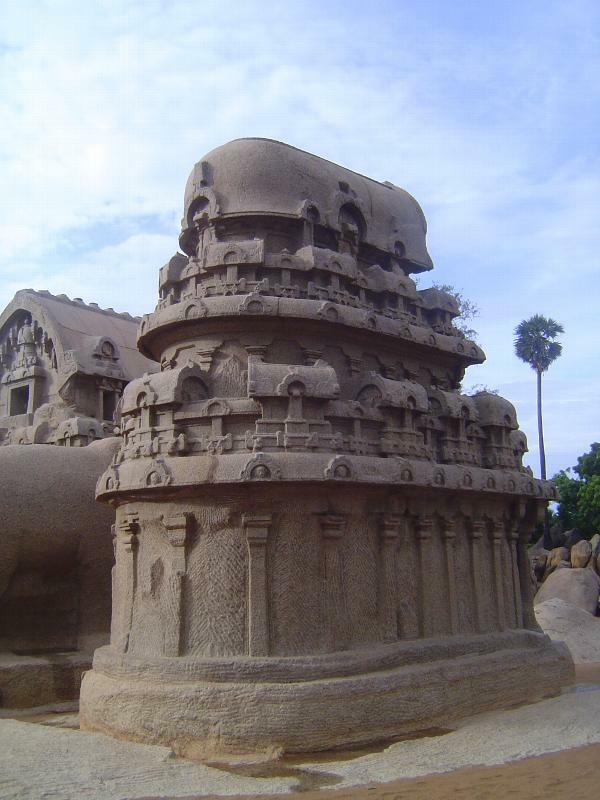 In any event, since before the British arrived they've been called the Five Rathas, or temple carts. None of them have wheels, real or otherwise. The temples are named for characters from the Mahabharata, but these are folk names from much later times. They're useful only as handles cheerier than Number One, etc. This one is called Draupadi. It's a stone version of a simple village shrine to Durga. The roof imitates thatch, trimmed at the corners with vines and supported at the corners by stone rafters. 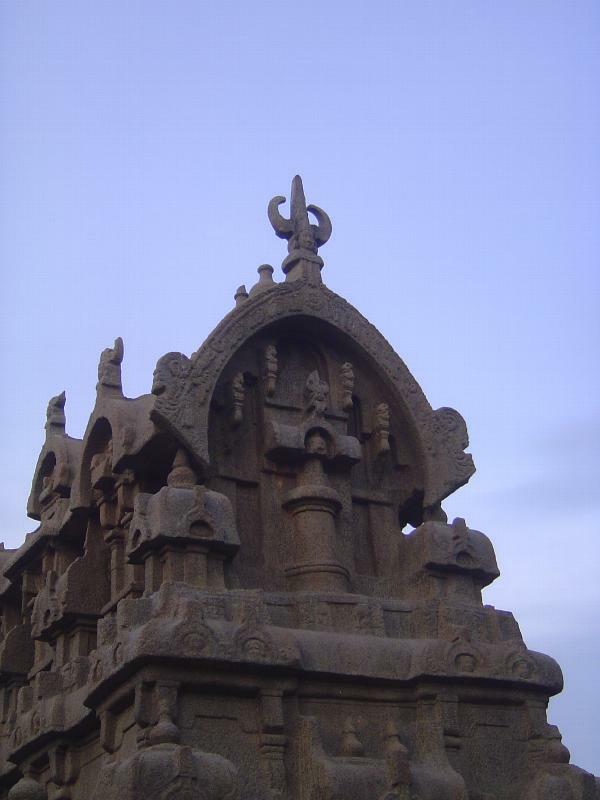 The stupi or finial sits at the near corner of the temple's platform, from which it was never separated or detached. (There is disagreement on this point, however; Longhurst says it was once on the roof but probably removed by treasure seekers. 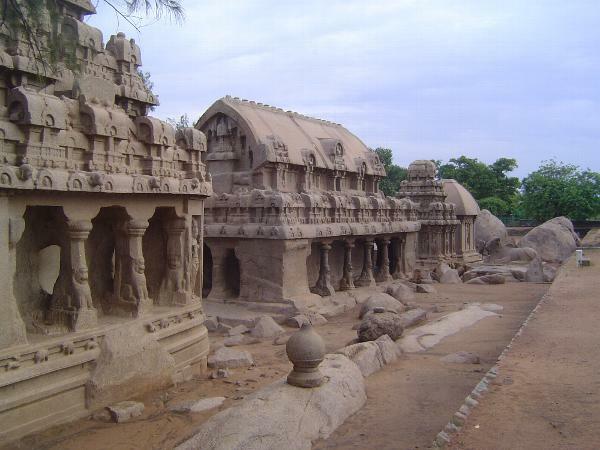 See his Pallava Architecture, pt. 2, p. 21.) The figures in the side-wall niches are Durga, except at the front, where one guard holds a bow and the other holds a sword; the niches are topped with makara toranas. Inside the shrine, Durga and her ganas or attendants stand before two devotees. One prepares to cut off his head, while the other hopes that a bouquet will suffice. 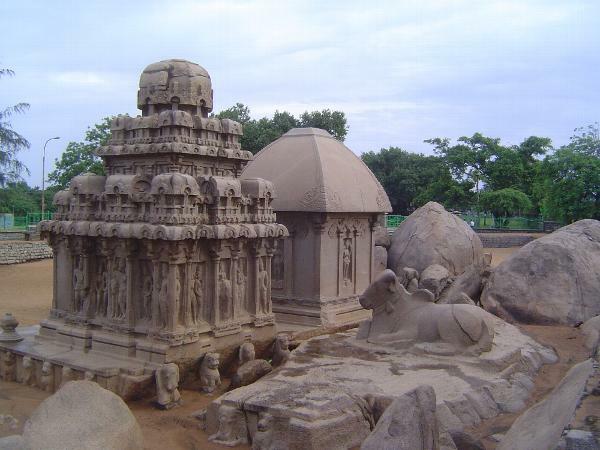 A view from the other side of Draupadi and the so-called Arjuna Ratha, really a Shiva temple, as indicated by the resting bull behind it. 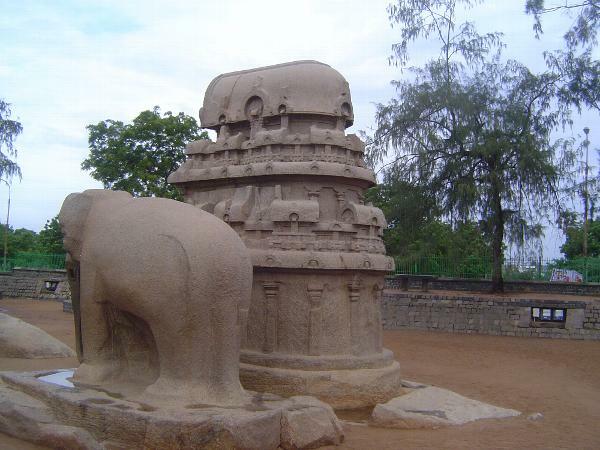 On the side facing the bull, there is an image of Indra on his elephant. 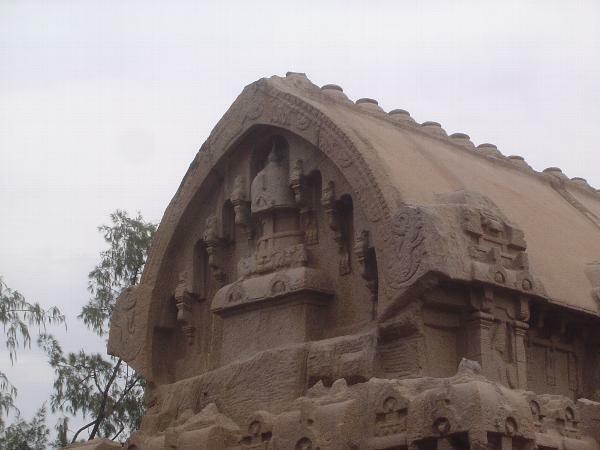 The roof comprises two sets of miniature temples reproducing the larger temple of which they are part. Call it fractal design. Some say that he is instead Subrahmanya, the god of war and victory. Two royal ladies are to his left; to the right are a sage and disciple. 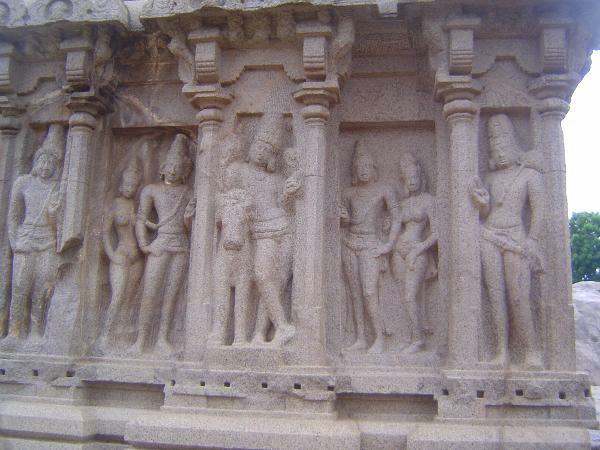 On the south side, Shiva leans on Nandi and is flanked by royal couples and, perhaps, directional deities. 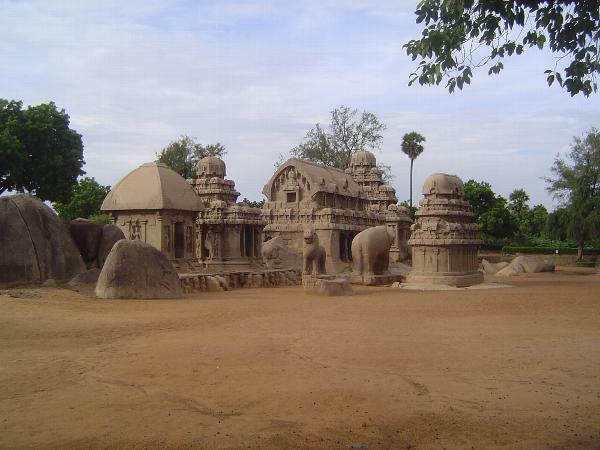 An unusual temple, apsidal and similar in footprint to its companion elephant. It bears comparison with the larger, more complete, roughly contemporaneous, but perhaps less elegant Durga Temple at Aihole. It's called the Sahadava Ratha. There is no interior corridor to perambulate the empty sanctum. 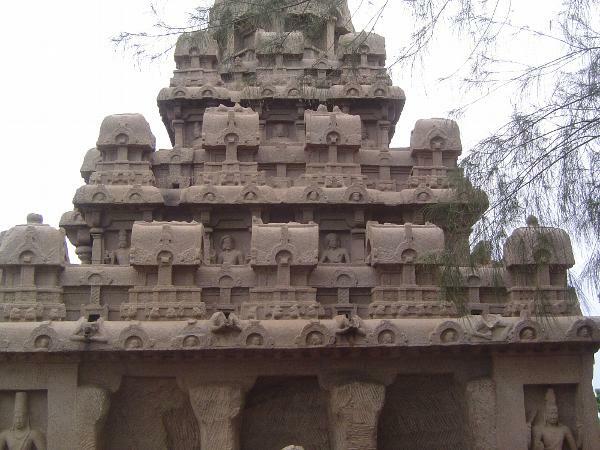 The upper levels have miniature versions or fractals of the entire temple. 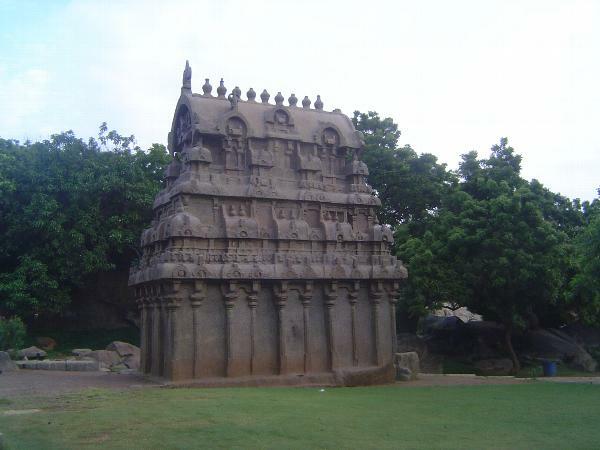 Possibly a Vishnu Temple, this is the so-called Bhima Temple. 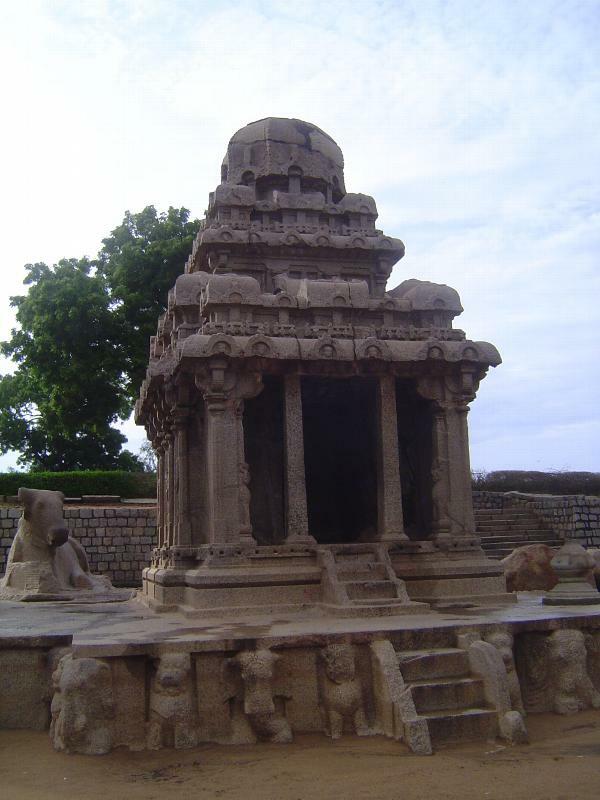 Such temples were carved from the top down, and in this case, work was abandoned with the upper stories complete but the lower level unfinished, with its four corners still in place and the interior not yet hollowed out. A vertical crack had formed, and James Fergusson, still after all these years the most entertaining of writers of this subject, thinks that the crack explains why the lower level was never completed. He writes that the stoppage "arose from unskilfulness on the part of workmen employed in a first attempt. Having completed the exterior, they set to work to excavate the interior so as to make it resemble a structural building of the same class, leaving only such pillars and supports as were sufficient to support a wooden roof of the ordinary construction. In this instance it was a mass of solid granite which, had the excavation been completed, would certainly have crushed the lower storey to powder. As it was, the builders seem to have taken the hint of the crack and stopped the further progress of the works" (I,331). The cracks were pointed with cement sometime before 1930. 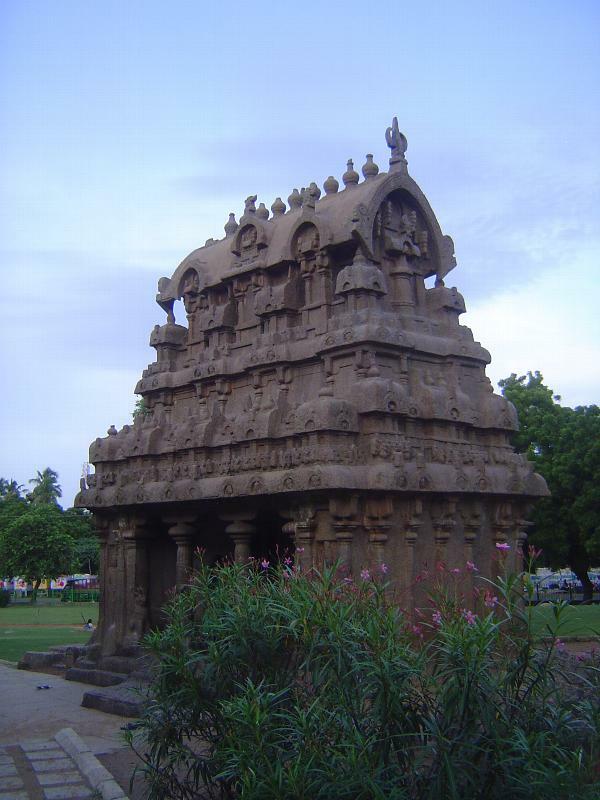 Longhurst writes that the roof "would seem to be the prototype of the ordinary wagon roof of all the great gopurams or gateways of the South Indian Temples" (pt. 2, p. 24). The eaves of the temple imitate, as Fergusson noted, wooden rafters. 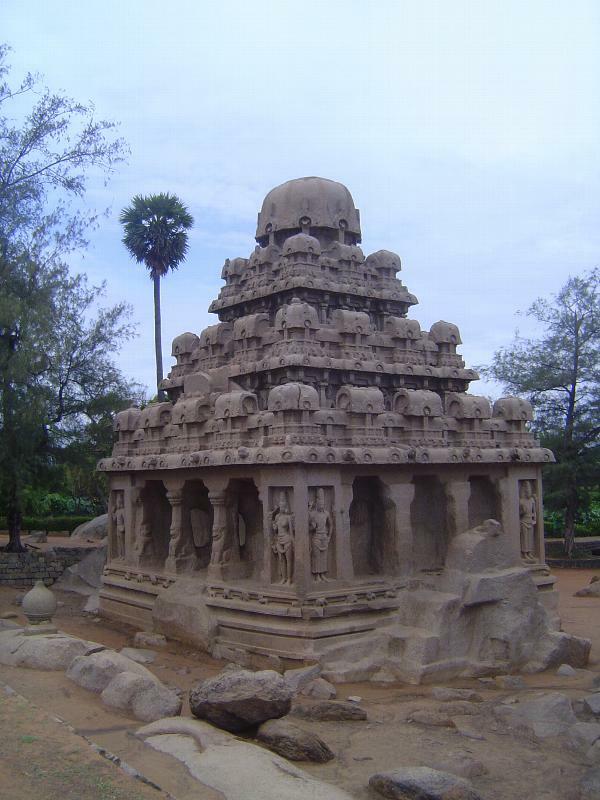 The tallest of the temples is the so-called Dharmaraja. 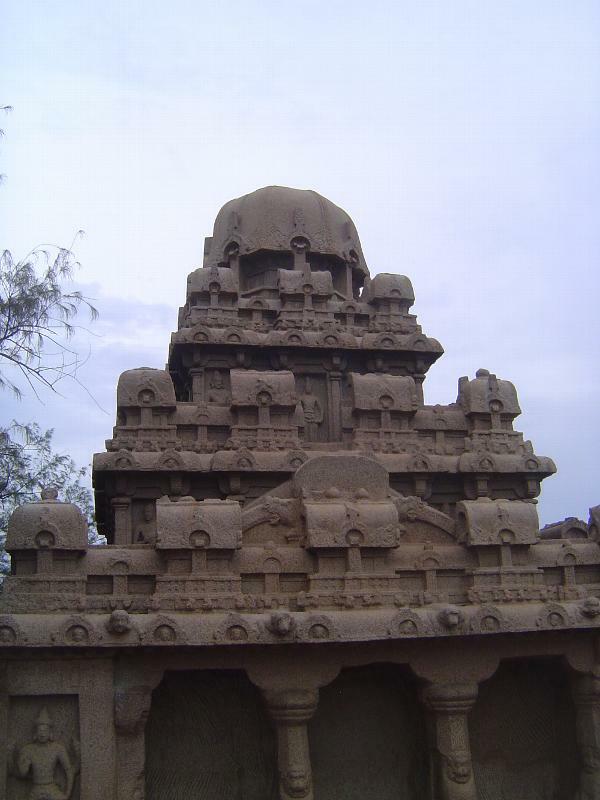 Remnants of the ridge remain between it and the neighboring Bhima Temple. 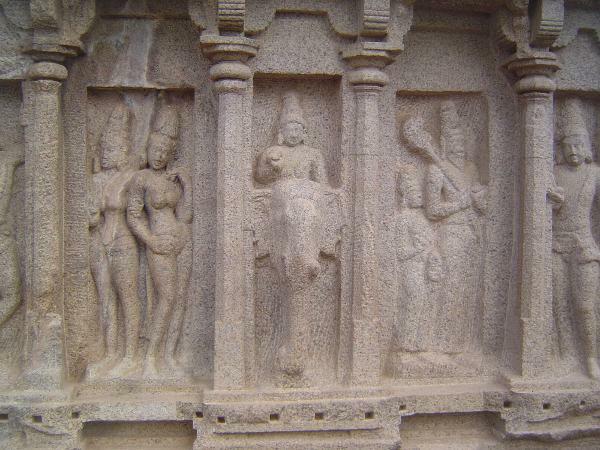 The pairs of deities at each corner are composite deities. The two nearest the camera are Ardhanari and, to the right, Harihara. Figures peer from every level, although those on the lowest level have been decapitated. A relocated finial. 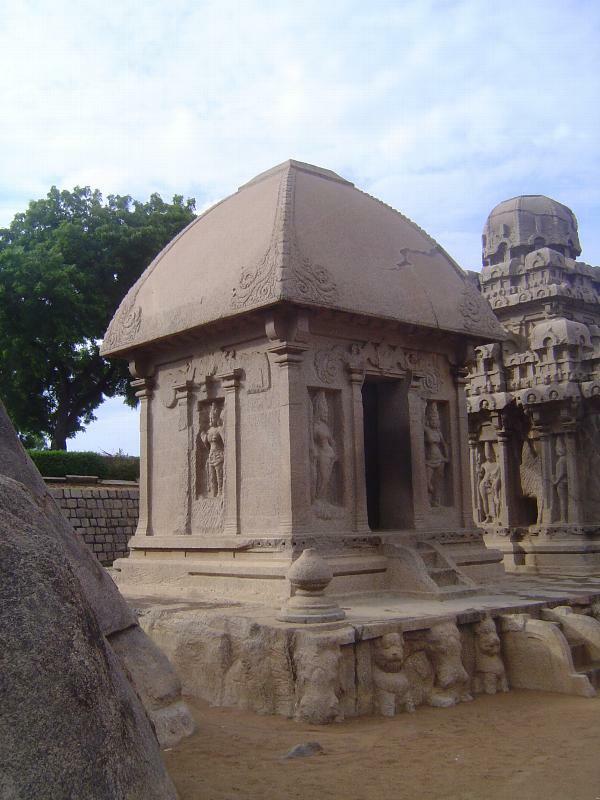 The Bhima Temple crack of which Fergusson spoke is not to be seen; he wrote that from the interior of the temple you could look up and see the sky. Here, separated from all the others and not far from the Varaha Temple and Arjuna's Penance, is the Ganesha Ratha. It's the most finished of all the rathas. Here is the description offered in 1788 by Chambers: "...there is a pagoda rising out of the ground, of one solid stone, about sixteen or eighteen feet high, which seems to have been cut upon the spot out of a detached rock, that has been found of a proper size for that purpose." 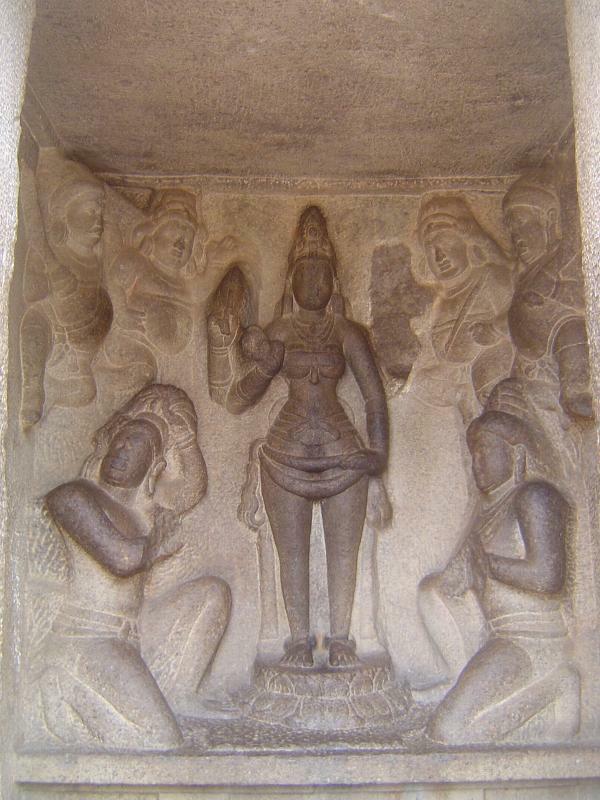 A decade later, another visitor wrote that "within is the lingam." By 1808 it was gone. Ganesh arrived to take Shiva's place. The eave once again has rafter look-alikes.